Every spring, I pull out all the weeds from my garden and put some nice compost into the soil. Then I plant my spring crop! Last year was more compact and a little less wild than the year before to get action-packed results in a small space. This year was a complete surprise! I planted in the winter time and forgot about it. Then all of a sudden I looked and there were veggies everywhere! We had fava beans, kale, and onions that I had forgotten about.That’s the exciting thing about planting food in the winter that doesn’t need maintenance. We had really tapped out the nutrients from the soil for a few years, so we grew the fava beans to nourish the soil. Roger Doiron of Kitchen Gardeners International explains that all members of the legume family, including beans, peas, and lentils, replenish the nitrogen compounds that other plants need to grow. When I first discovered the fava beans, I ate some of them raw and they were delicious. To cook them, we peel away the outer pod and steam the beans for about five minutes. Then the inner beans pop out easily from the little bean shells. I tossed some onto a fresh boiled salad and I give them to Bear to eat. He loves them! He picks them up with his little fingers and pops them in his mouth. We also have volunteer nasturtiums, which are edible flowers, and wild arugula that also volunteers. A volunteer crop is one that we didn’t deliberately plant. It grows from the seed of an old crop and keeps coming back year after year. This is my surprise winter garden! 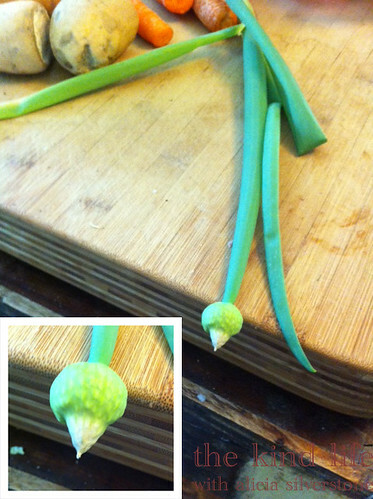 The bulb of a spring onion eventually gets more round and white. Spring onions have more of a bite than green onions, and can be used raw or cooked and are yum in salads or sauted. I love to pick them early and slice up the bulb a few at a time to save in a jar to sprinkle on my soups. Then the green part I use like scallions – crunchy and delicious. Yum! 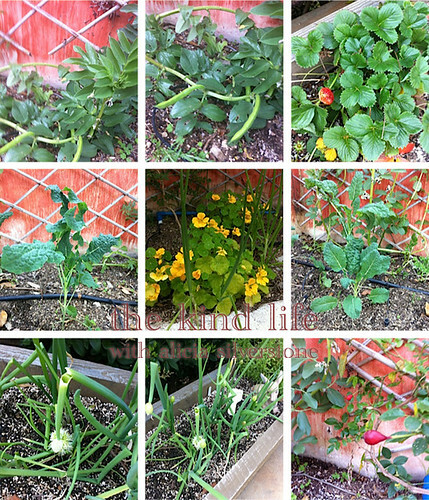 Growing your own food is fun, I love eating from my garden! What’s in your garden right now? Previous PostSummer Potato Salad & More BBQ Recipes! Next PostMother's Day: English Breakfast in Bed & More Goodies for Mom!